I must admit, that when I journeyed to StuVi 2 to check out the Sargent Choice Test Kitchen, I was a bit nervous. My fears were mostly caused by the fact that I hadn’t cooked in the two months since I arrived at Boston University--my biggest culinary achievement being a lopsided peanut butter and jelly sandwich. In other words, I was a tad rusty in the kitchen. Yet when I stepped into the apartment of Karen Jacobs, the driving force behind the Test Kitchen and a professor of Occupational Therapy at Sargent College, I immediately felt at ease. Jacobs offered everyone present the chance to make a cup of tea – I chose a cinnamon apple flavor and happily sipped it for the rest of the evening – and greeted her guests with a pleasant blend of friendliness and enthusiasm. Her excitement mainly stemmed from the fact that were weren’t only making Vegetarian Brown Rice Sushi that night (as planned), we were also preparing miso soup and dim sum that Jacobs humorously described as an “experiment.” An experiment that would require the work of all the guests in attendance. The group included about 25-strong and surprisingly diverse--throughout the night, I met fellow undergraduate students as well as high school and graduate scholars and older friends of Jacobs. As we began to mill around the various stations, helping to peel and cut vegetables and performing other preparatory tasks, everyone chatted. One girl taught another how to cut tofu in her palm; another guest introduced me to how deliciously sweet Chinese cabbage is when eaten raw. Every so often, Jacobs would interrupt our conversations to offer the group pieces of cooking advice, like how one should “never boil miso,” and that in order to make brown rice sticky (which we were using in place of white rice in order to make our sushi healthier) you have to use “less water” and add some white rice vinegar. Before I knew it, it was time to eat dinner. Or, I should say, assemble dinner, at least when it came to the sushi. A wealth of ingredients had been collected on a table in the corner of Jacobs’ apartment, leaving guests to decide what they wanted to eat. Personally, I preferred a concoction of brown rice and cucumber, carrot, and sweet potato slices; others added items such as tofu and imitation crab. Then one could choose which dim sum to try, since Jacobs and Japanese exchange student Patty Tsai had created two. One dish contained Chinese leeks, shiitake mushrooms, sesame oil and pumpkin. The other was filled with soy sauce, Chinese cabbage, sesame oil and tofu. Despite the fact that they were created without a recipe, they both tasted delicious. As did the miso soup – made with miso paste, water chestnuts, bamboo shoots, daikon radish, tofu, and shiitake mushrooms--which was a wonderfully warm treat on a chilly fall night. Luckily, there was no shortage of food that night. In fact, after the group had helped clean up, several guests went home with leftovers. But the best part of the evening--besides the cooking of course--was the comfortable atmosphere that Jacobs created. It really did seem like a home-away-from-home; something that is always a joy for homesick freshman such as myself. My initial fears were unfounded, and I will no doubt be returning soon. 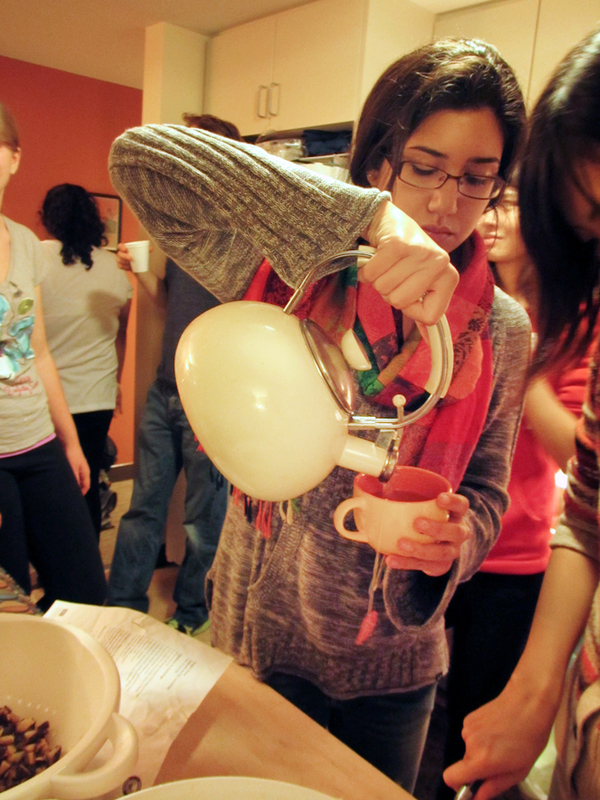 The Sargent Choice Test Kitchen meets on Wednesdays from 8 to 11 pm, at 33 Agganis Way, Apartment 2302. Upcoming dishes include Minestrone Soup, Quinoa Avocado Salad, Penne with Roasted Tomatoes, and Karen’s Beloved Potato Latkes. And if you don’t want to trek to West Campus each week, don’t worry! 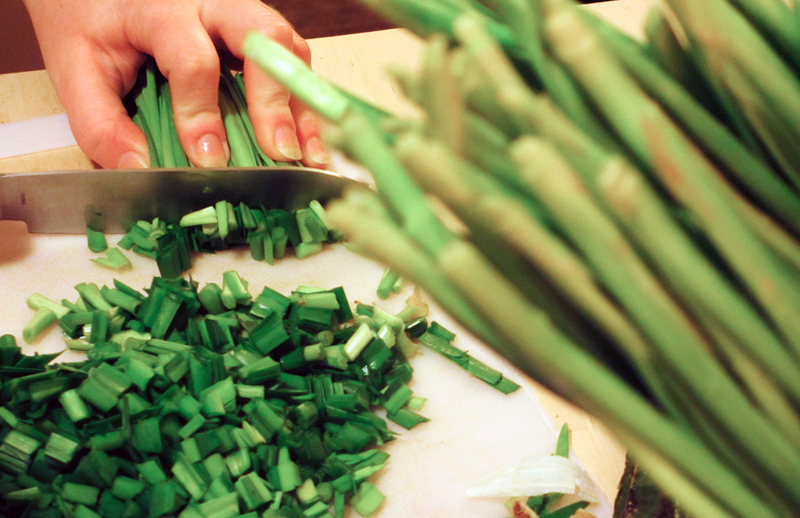 Sargent Choice Test Kitchen East will be starting on January 17 from 7:30 to 9:00 in the kitchen at the Hillel House.